Five cafés that take their food as seriously as their coffee. While Starbucks engineers ways to move its lines as quickly as possible, Macondo is comfortable with its leisurely pace. 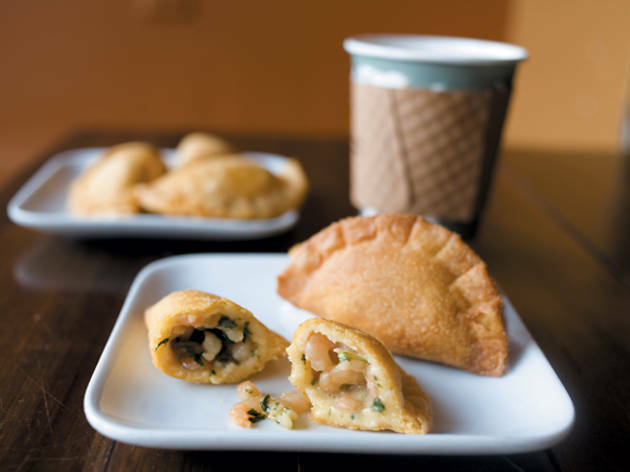 Its empanadas—with traditional (shredded beef and potato) and updated (shrimp and goat cheese) fillings—are piping-hot, crisp and substantial accompaniments to the fair-trade Colombian coffee (which includes the Juan Valdez brand and Cafe Macondo, a Metropolis house roast). 2965 N Lincoln Ave (773-698-6867). We could tell you the tres leches cake is moist, rich and milky. But it’s enough to say that Rick Bayless name-checked it as his favorite, and it’s the best (if not the only) reason to visit this dim, quiet Pilsen café. Pair a slice of the caramel version with a cup of Intelligentsia coffee for a one-two sugar-caffeine punch. 1733 S Halsted St (312-829-4150). Try as it might, no bakery case can adequately preserve a croissant. This Ravenswood spot, which bakes its own pastries, is one of the few coffee shops where we don’t have to pray when we bite into the croissant: We already know it will be fresh, flaky and buttery. 1812 W Montrose Ave (773-769-2000) and 2601 W Leland Ave (773-649-0015). Roasted oyster mushroom sandwich with aioli and a cup of parsnip soup? If that sounds more like lunch at Lula Cafe than typically prepackaged coffeehouse fare, prepare to be blown away by the food at this Uptown café, where the meats are roasted in-house and the sandwiches are made to order with fresh, seasonal ingredients. 4656 N Clark St (773-942-6763). 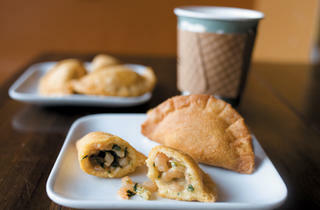 The breakfast pastries are consistently exceptional. Dumplinglike spaetzle comes with comforting braised lamb or local vegetables. For dessert, there is a case of stunning, elegant cakes. In other words, there’s no reason to ever leave this Austrian coffee shop, but when you finally do, you’ll be very, very full. 3601 N Southport Ave (773-868-1857) and 4363 N Lincoln Ave (773-868-1876).